What are the best ways to buy gold? And where to buy gold for the best price? That's what we'll explain on this page. We'll show you how professionals have arranged the world gold market so that they can deal physical bullion gold much cheaper and much more safely than you. Then we'll show you how you can participate in their professional market. To do that we'll introduce you to BullionVault. We'll also tell you about the other ways you might choose to buy gold : i.e. coins and small bars, ETFs, certificates, gold futures and mining stocks. When you've understood these alternatives we're sure you'll have even more confidence you're making the right choice with BullionVault. More than 70,000 users from 175 countries use BullionVault. In the last two years they bought more gold through BullionVault than through any other direct bullion ownership service in the world. BullionVault now stores over 38 tonnes of gold, which is much more than most of the world's central banks. Every ounce is owned privately, by people like you, and stored in the accredited professional bullion market vault of their choice, in one of several different vaulting locations worldwide. OK then? Now you know you're not wasting your valuable time let's get on with understanding how the professional gold market works, and how BullionVault.com lets you use it. The most competitive gold prices in the world, the ones you see published in the papers and on the internet, are enjoyed by the participants in the professional bullion market:- gold dealers, refiners, government agencies, bullion banks and the occasional big investment organization. This professional market only deals in what are known as Good Delivery bars. If you're not trading these bars you are excluded, both from their market and from their very competitive prices, which means you'll pay more when you buy and receive less when you sell. Good Delivery bars are cast by a small group of precious metal refiners accredited by the professional bullion dealing community. They are accurately assayed and guaranteed always 99.5% pure gold or better. The market trades their pure gold content (gross bar weight x purity) which is known as fine gold, so no-one who trades professional market bullion ever pays for impurities. Good Delivery bars have high integrity because they have never been in private possession. From the day they're first manufactured they are kept in bullion vaults recognized and monitored by the local gold dealing community. Every time bars are moved - by accredited bullion couriers - a careful record is maintained, showing continuous storage through trusted hands. This guarantees gold bar integrity in a way that keeping gold at home, or even in safety deposit boxes, simply cannot match. The result is that a professional buyer's vault will accept deliveries of these bars direct from the seller's vault without re-checking their purity. The seller gets paid quickly and efficiently, and bullion trading costs are much reduced for both buyer and seller. This is what Good Delivery bars are all about, and it's why the high volume, high integrity, professional bullion market is the only place where a sale of gold nets the seller the widely published bullion price. Good Delivery bars are large - usually 400 troy ounces each (12.4kg), and at $1,600 an ounce that's $640,000 a bar. Yet even having enough money to buy a whole bar or two only solves half the problem. You still need that key relationship with a formally recognized bullion vault to look after the gold while you own it. Otherwise your gold loses its guaranteed acceptance as 'Good Delivery', and cannot easily be sold at full price. But those vaults are ultra-cautious and typically don't deal with the general public. Even if you did spend the considerable time, cost and effort of setting up a vaulting account with one of them you'd find the minimum monthly storage fee means you'd need about 15 big bars of gold to get an economic rate for bar storage. These are the barriers which keep private users out of the professional bullion market. BullionVault.com changes all this. It enables people from all over the world to own professional market gold and keep it in any quantity in officially recognized bullion vaults in one or more of several different vaulting locations worldwide. All BullionVault gold is held in Good Delivery form. So when you come to sell, your buyer is able to trust the purity and weight of your gold, which is guaranteed by BullionVault itself, because we know that you never had the opportunity to corrupt it. Most people who buy gold don't stop to consider how important bullion integrity is going to be when they come to sell, but it will be critical to the price they get. Too much money is lost by gold investors who find out that lower integrity bullion has a higher premium and simply does not fetch the spot price when it is handed back over the counter. The round-trip dealing costs (i.e. buying and selling) for bullion coins and small bars is usually about 7% to 10%, and it stretched to 20% in late 2008. Your trading costs on BullionVault are much lower. When you buy or sell you pay a commission whose maximum rate is 0.5%, falling progressively when you invest above $75,000 to just 0.05%. The round-trip costs you 1% on small amounts, falling to an incredible 0.1% for larger customers. Estimate your commission and storage fees using our cost calculator. You can start buying gold in amounts as low as 1 gram which is much smaller than the smallest coin. There's no upper limit. You can deal thousands of ounces if you want to. In fact you should call us (+44 20 8600 0130) if you want to deal more than 800 oz. We can save you even more money on orders of this size. BullionVault customers also save money by cutting out the middleman and dealing directly with each other. They do this on the internet using BullionVault's public order board, which is like a stock-exchange for privately owned Good Delivery gold. The open price competition operating between thousands of our users is what has driven down the cost of trading gold, and taken the average spread across all BullionVault users to exactly zero. BullionVault itself is the one of the biggest of the thousands of buyers and sellers operating on this ‘stock-exchange’. We sell gold from stock and buy gold back into stock. But the important thing here is that we have to beat the quoted prices of all our clients to attract your business. This vital component - open competition on price - is what forces BullionVault’s gold prices to be exceptionally competitive, to the point where we can all but guarantee that as a retail customer you will not buy gold cheaper, nor sell it dearer, anywhere else on Earth. There are savings at settlement time too. You don't have to arrange for expensively insured courier deliveries. All the gold you buy is already in the vault where you want it. Then, when you sell, your buyer wants his gold in the same vault, and he frequently pays a small fraction over the spot price for your gold because it saves him the shipping cost. It's worth understanding that BullionVault is open-ended. The amount of gold in BullionVault floats up and down according to customer demand. When customers are buying from our stock we simply replace the falling stock with new Good Delivery bars bought from the professional market. Then, because the gold remains Good Delivery, when our customers are selling to us we sell surplus bars back to the professionals. What we are doing is acting as a buffer between the amounts that private buyers want to deal, and the inconveniently large sums that the professional market deals. Please take me straight to BullionVault's "get started guide". Your gold is your outright property, stored in specialist facilities reserved exclusively for BullionVault clients and run by leading accredited professional bullion vault operators. You choose the storage location :- Zurich, London, New York, Toronto or Singapore. You are truly isolated from the systemic risks in the financial system. You have taken legal delivery of your gold and you own it directly in physical form. Unlike the huge majority of investment products no company's financial failure can deprive you of this gold. BullionVault, BullionVault's bankers and BullionVault's vault operators could all fail, and your gold is still perfectly safe. Each and every working day BullionVault publishes on the internet the complete register of all its gold owners - with each owner listed under a public nickname known only to themselves. You can use this to prove your specific and undiluted ownership of your gold at any time. The register total reconciles exactly to the official vault bar list published with it on our Daily Audit. The bar list is produced by our vault operators, independently of BullionVault. No other custody business in the world subjects its records to this continual, daily, public scrutiny. Our auditors produce an annual report verifying the accuracy of this daily reconciliation, and post it on their own website, ensuring its complete independence from us. We employ independent assayers to report once a year on the quality of the bars delivered to us by the professional market. Our auditors check back with our assayers and publish the verified assay report, also on their own website. Our storage contract with out vaulting providers prevents us from removing gold from the vault without declaring the withdrawal publicly on the front page of our website not later than the business day before removal is scheduled, remaining visible to all visitors of the BullionVault website until the bullion has been delivered out of the vault. All removals of bullion must be publicly declared or the vault operators will refuse to release the bullion. No other gold custody business in the world enforces a similarly transparent policy on all gold withdrawals from the vault. BullionVault is also the only gold market in the world which stays open 24 hours a day, 7 days* a week. You, and 70,000 other users, are able publicly to quote buying and selling prices of good delivery gold directly to each other. Only BullionVault lets its customers compete with its own quoted prices to get all users the best possible deal, whether they are buyers or sellers. Subject to modest additional fees and taxes you even have the right to withdraw gold from the vault. Of course the huge majority of BullionVault users leave their gold right where it is, because that's the way they continue to be able to sell Good Delivery gold at spot market prices. Any deal you transact on our order board is settled instantaneously. We checked that both buyer and seller had the resources on-hand to settle. BullionVault offers nobody credit, and settles at the point of trade, so nobody can let you down after you deal. You can withdraw your money immediately after you sell. Your money will leave your BullionVault client account by the end of the next business day (London time). There is no minimum period for investing, and no penalty for withdrawing. You don't trust internet security, and neither does BullionVault. So although it runs the most secure protocols available, BullionVault assumes that your account is at risk of penetration, and must be safe if penetrated. Unlike Digital Gold Currency we will not pay anyone but you, and we will not allow any transfer of value to another system user. So, both for your safety and to obey international anti-money-laundering laws, when money is withdrawn from your BullionVault account it is sent straight back to the original funding bank account (yours) or otherwise to its verified replacement bank account held in the same name, endorsed by your new banker, and checked by us. For the same failsafe reason our Burglar Alarm service can alert you to all log-ins to your account, with an immediate SMS message to your cellphone. The system is very easy to use and very safe. In fact hundreds of our customers have written to us thanking us for making buying gold so straightforward (we publish many of their comments on our site). But, just in case, we invite you to phone us (+44 20 8600 0130) and we'll talk you through your first few deals one click at a time. We check that everything is exactly as you want it while you're still on the 'phone. You'll be amazed how simple buying gold now is. This combination of safety, value, accessibility, transparency and service has quickly made BullionVault the most popular direct gold ownership service in the world. Go straight to BullionVault's get started guide now. The critical thing for an efficient and safe purchase of gold is to take delivery, and in normal circumstances to avoid immediate possession, while making sure you have the right to take later possession if necessary. This is not intuitive to most gold buyers. Delivery (sometimes called settlement) is when you become the owner of your gold. For your safety it is vital that you take delivery, because that is when you stop being the balance sheet creditor of whoever sold gold to you. But it is not vital that you take delivery into your possession. Private possession of gold is usually a mistake. Almost nothing you can do will provide 100% assurance that the last person to touch your gold, before you, didn't substitute it for a good fake product. You will have to accept a significant discount when you sell, because your gold is not in a form which can be accepted by the professional markets as Good Delivery. If you bought gold intending to be safe in a crisis, and took possession of it, you will, in that crisis, find it impossible to spend your gold as if it were money. Take a gold coin out of your pocket today, and try and pay somebody with it, and you will be met with a blank stare. Gold is not currency. You cannot easily use it now to pay for anything. Of course there is a belief that it would operate as currency in hard times, and it remains just about possible. But the empirical evidence is not good. In places in our own times where a currency has broken down - places like Russia, Yugoslavia, Argentina, Iraq, Zimbabwe - gold did not emerge as a circulating currency and there was no prospect whatsoever of quitting those countries carrying gold. In these circumstances privately possessed gold was at best useless. At worst it can be extremely dangerous. The truth about gold being used as money is this:- it is occasionally adopted in immensely rich societies (e.g. USA to the 1930s, industrialized Europe to 1914, Spain after discovering America, Imperial Rome, Ancient Athens). But if you try to use it in a crisis-torn country during a financial meltdown stick to small quantities - because you will probably be selling it as contraband, and at a huge discount to its international market price. For larger (investment) quantities there is an effective alternative. Far better than gold in your possession is gold which is fully delivered, and is your property, but which is held in a country enjoying political stability, high local living standards, sound finances, the rule of law, and no tense international relations. On all of these criteria Switzerland (our most popular vault) scores very well. So you are probably better advised to postpone taking possession until an emergency makes it absolutely necessary. In the meantime take delivery, but into a professional offshore vault, rather than into your personal possession. Your gold will be much safer than in domestic or safe-deposit box storage, it will be far cheaper to insure, and it will retain its full resale value. What's more you'll be able to bring your money back home later. Exchange controls usually stop capital flight, but rarely inward investment. Understanding delivery is incredibly important for your safety. You are not exposed to the insolvency of your custodian. Your gold is not on the custodian's balance sheet. No liquidator could exercise a claim over your gold. That's the law. What you need to understand is that most investments - even in gold - are structured to make you a creditor. As a creditor you own nothing, but you do have a creditor's claim over the assets of your supplier, which is safe so long as your supplier remains solvent. If your supplier becomes insolvent the law attempts to treat all creditors fairly by requiring the balance sheet assets of that supplier to be shared pro-rata between creditors. Of course insolvency means there is not enough to go round. But the law also makes it possible for you to be fully protected from insolvencies by arranging outright ownership. To avoid losing your money in that sharing out process you must avoid being a balance sheet creditor. This means that what you buy must be delivered to you (i.e. settled). Then it is removed from the supplier's balance sheet and becomes something you own. It's the law that a custodian's liquidator must deliver all property held in custody to its rightful owners - in full - before that sharing out of balance sheet assets to creditors can begin. This means you are 100% protected from the insolvency of your custodian by the physical gold which is stored as your property. This is what you get with BullionVault gold ownership. You become one of these privileged outright owners at the point of your BullionVault purchase. Almost nowhere else in the whole investment world - including gold - is delivery made instantaneously at the point of your trade. We strongly recommend that however you eventually choose to buy gold you make sure it is delivered as soon as possible. Do not be fooled into thinking you are safe with undelivered (unallocated) gold, because it rests indefinitely on your supplier's balance sheet, and this exposes you to their insolvency at any time in the future. Having available a choice of locations within one organization is an additional protection, because you can quickly shift your custodial location in response to dangerous geo-political events. BullionVault's is the only system in the world which allows you to sell your gold in one location and (because settlement is instantaneous) use your cash to re-buy immediately in another. You can do this any time of day or night, 7 days a week. Actuaries' calculation of risk show, beyond doubt, that your gold is much safer in an accredited vault than it would be if you stored it at home. That's why insurance is included in the vaulting charges of most professional bullion vaults. On BullionVault, from the instant you buy to the instant you sell your gold is insured automatically, and the cost of insurance is included in the tiny custody charge of 0.12% per annum. Customers can view the evidence of BullionVault's insurance on-line at any time. Bearing these issues in mind then lets examine the other ways of buying gold. Buy gold coins or small gold bars and you can hold them in your hand, or possibly in a safe deposit box. Your gold is delivered (good), and in your possession (bad in large quantities). You should try to get insurance cover if you buy a significant quantity, but this is not always easy, and of course you have to declare that you own gold in order to insure it, which you might not wish to do. You will certainly find there is a significant premium on purchase price and a significant discount at sale, and this will dent your profits if you are buying for investment. Expect to lose about 8% this way, perhaps a little more in single coins and smaller denominations, or a little less in bulk. You could find that you become a trapped owner should a financial meltdown occur. You may also discover your gold is not easily liquidated if - for example - exchange controls are implemented in the country where you live. In spite of the drawbacks many people who buy a significant quantity of gold for investment offshore do keep a much smaller reserve in coins. 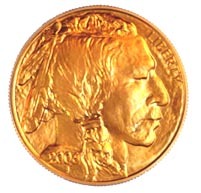 This 2006 USA Liberty 'Buffalo', which is 1 oz and 99.99% pure gold, is owned by BullionVault's director, who thinks that while it may lack the investment efficiency of offshore good delivery bars, it is nevertheless very pretty. He paid a premium of 7% over spot and like most people who own coins has never yet tried to sell it. It is relatively straightforward to buy gold coins. A search of Google for "gold coin dealers" will quickly produce some suppliers. Watch out for the big difference between numismatic coins and bullion coins. Bullion coins like the one pictured have no value as a collectible, and their worth is based only on their gold content. Numismatic coins are for collectors. Their values vary according to any number of variables not related to bullion gold values. Gold certificates are usually unallocated gold with an option to convert into allocated at the investor's option and cost. Because it is undelivered, and remains indefinitely as a balance sheet liability of the provider, we cannot recommend unallocated gold to any retail customer. The insolvency of the provider risks total loss to the investor. Most gold certificates are nevertheless unallocated. They confer a right to allocate, but allocation and the resulting storage charges may be so expensive that the only time the right is likely to be used is when the supplier is in financial trouble, and then it could be too late. Why do suppliers offer unallocated gold? It's because it is very profitable. They have the use of your unallocated gold so they can lend it for revenue, or otherwise put it to their use. In very few cases is that the intention of the private bullion buyer. Before you choose a certificate program make sure you know if the gold is unallocated - it usually is - and make a conscious decision to accept the considerable long term risks. Trading gold futures means you can buy gold on credit, gearing up your gold investment. But if you buy gold this way, sharp volatility will put you at risk of large losses arising from the leverage. If you are a short term speculator with a particular view on the gold price, and particularly if you are a short-seller of gold, then you should look at our detailed section on Futures. The exchange-traded gold funds are a high volume investment vehicle providing exposure to the gold price. They benefit from the familiarity of being traded on a normal stock exchange. If you already have a brokerage account set up then these can be one of the most convenient options for you. However it is well worth your while understanding the key issues from our section on ETFs. Gold mining stocks face ever-growing problems of politics, cost and geology. Moreover - much to many people's surprise they have very significantly underperformed bullion over the recent past. The underlying reason for this is that modern attitudes have made gold mining a bit of a pariah in business terms. The shattered landscapes and plentiful poisons left behind by previous generations of miners have created a mistrust by environmentalists, and by governments, which are now routinely applying very high clean-up standards and costs before granting mining licences. Governments also frequently require infrastructure and other social benefits to be financed by mine operators - acting as a sort of compensation to local communities. They are well able to assess the value of the mine, and force up the social price to the point where it is only just a profitable undertaking. That means that the profits of mining are now more than ever expended in social works in the country and vicinity of a new mine. Perhaps this is as it should be, but it is not good for shareholder returns. On top of that the rising cost of energy has in many cases been crippling. The result is that there has gradually developed a premium on gold which is already out of the ground and in its refined form - bullion. But that does not deny that great fortunes can be made by people who find the right gold mine stock - one with large deposits, low production costs, and a tolerant government. If you are interested please read our page on mining. We hope you have found this walk through the main ways of buying gold to be instructive. We firmly believe that BullionVault offers you the cheapest, safest and most accessible way that has yet been devised. You can register now, and quickly you'll be owning the gold you seek to protect you from the appalling mismanagement of our currencies and economies. We respect your privacy. Your BullionVault registration will never be sold, rented or otherwise made available to any third party. However we do not demand privacy for ourselves. You can at any time click on 'About Us', or 'FAQs : Governance' and read about the company, how it is structured, who owns and runs it, and the personal CVs of senior management. This information is directly available from our home page. We finish by summarizing the advantages of BullionVault - many of which are found nowhere else. 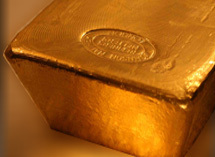 BullionVault deals good delivery gold - the only gold accepted on the world's spot markets. Your gold is not subject to loss of integrity and marketability while you own it. BullionVault has no minimum or maximum investment. BullionVault gives you instant access to your money. You can sell gold and redeem cash to your bank account in 24 hours. When you buy on BullionVault prices are significantly lower than when you buy gold coins and small bars. When you sell on BullionVault prices are significantly higher than when you sell coins and small bars from private possession. Only BullionVault offers open price competition, with 70,000 users - including you - competing as both buyers and sellers, and publicly quoting their own dealing prices. Competition between so many users greatly narrows your dealing spread. Typical dealing spreads at BullionVault's competitors are $22.00 an ounce. Typical BullionVault spreads are just $2.50 an ounce, and $0.25 is not uncommon. BullionVault commissions start at 0.5% and reduce rapidly above $75,000 invested, to just 0.05% for larger amounts. For storage you pay a tiny 0.12% per annum - that's less than one eighth of one percent - which includes insurance. BullionVault is unique in being open for trading through the night and through the weekend. Unlike increasing numbers of modern gold investment products BullionVault is not based on a complex trust which you need lawyers to interpret. You own gold. It's that simple. BullionVault lets you buy and sell directly in four currencies: US Dollars, British Pounds, Euros and Japanese Yen. You do not have to buy US dollars to deal. If you want to avoid your own currency you can sell your gold directly for another, without FX conversion expenses, because BullionVault provides ample direct gold liquidity in all three currencies. BullionVault lets you store in your choice of countries from among its several vaulting locations. With multiple vaults and instantaneous settlement on order board trades, you can trade out of one jurisdiction and into another in seconds, as you might well choose to do in response to dangerous geo-political events. Your account is protected by advanced security technologies, but BullionVault recognises that the internet is not 100% watertight, so BullionVault assumes security is capable of being breached and still protects you. You are protected by your Burglar Alarm, and by the restricted return of your money only to you, at your original funding bank account, or its verified replacement. Only BullionVault daily publishes a full client reconciliation to 3rd party bar lists and client money bank statements. Only BullionVault has a verification report of its daily reconciliation produced by its independent auditor's and published on their own website. Only BullionVault publishes evidence of its insurance cover. Only BullionVault has the confidence to give you 4 free grams of bullion and allow you to test the system's dealing and custody environment for yourself - entirely at BullionVault's risk. You can get started now. BullionVault will give you 4 free grams of bullion stored in your own vaulting account if you click here now and complete your registration. We are a phone call away and are happy to help. Our office address, email and telephone details are all listed under our contact details. You can also read about the company, its very strong finances, and the people involved. All of these details are published on our Frequently Asked Questions section. We believe in gold. We believe in the future you will be financially much better off if you buy gold now and store it safely and in the right way. We really can help you achieve this, with exceptional security, at the lowest acquisition and storage costs in the world, yet still with a minimum of effort.